I am part of working group 3 ‚conceptual analysis‘ of the european research network Cyberparks. The research project investigates the influence and the entanglement of the proliferation of information and communications technology (ICT) and public spaces, chaired by Carlos Smaniotto Costa from Portugal. My working group, led by Michiel de Lange, is concerned with the construction and provision of a fluid, common terminology within the project. Not as some prescriptive ‚guardians of language‘, but as curious philosophic therapists in the sense of the later Wittgenstein, we try to compile the central concepts that develop in the course of the project, aiming at a fluid, constructive understanding between the different participants and disciplins involved. Metaphorically speaking, we are translating between differnt parties in order to understand a third party, a party that has not yet formulated its scientific apparatus. It is not that easy to find common conceptual and mothodological grounds, given the diverse backgounds of the members of the working group, but on our initial meeting last week in beautiful Lisboa, we worked our way through to a trias of concepts that we chose to use as the starting point of our joint endeavour. 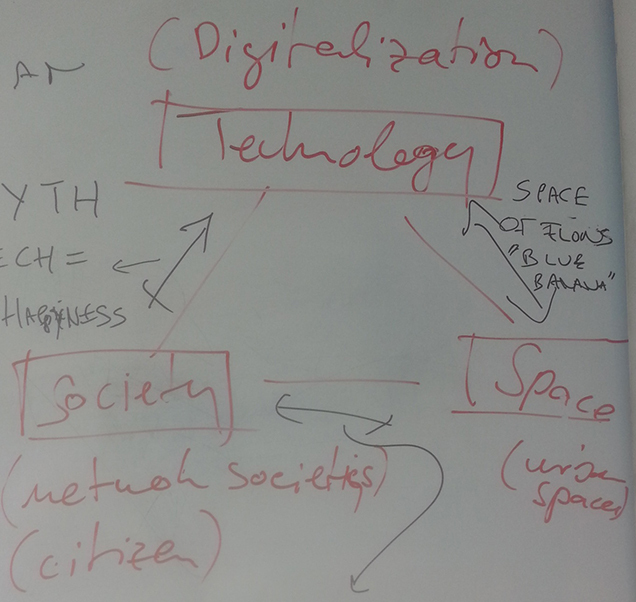 We hope that the triadic relation space — society — technology can turn out as a structure for us, a red line along which we can examine the concepts the discorse of the project evolves around. We are aiming not so much at a conceptual framework, that encloses the discourse of the research project as a whole, but at a conceptual network that develops around central nodes, so that political economy, water engineering, informatics, urban planning and the other perspectives involved can commonly develop a shared terminology as we proceed, and be it only a partial one. Space, society and technology are – so to say – our temporary categories, or our provisional epistemic objects as contemporary epistemology and Wissensforschung would have it. These concepts, and the ways in which we conceptualize their relations, might change in the course of our collective effort, but they give it a good initial spin, we hope. These are the very first steps of the working group, I’ll notice about further progress with details about publications and events through the official website of the project, as soon as it is established!